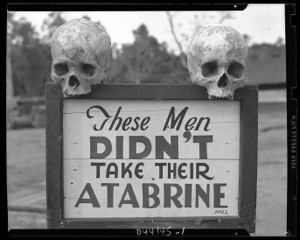 I came across this picture and it reminded me of wife’s late father’s memories of New Guinea. He served in New Guinea in late 1943, early 44 if memory serves me. He told about playing cards with the Aussies and serving in an Army hospital as a tech. While there he contracted dengue fever that turned his hair white. The fighting for New Guinea had ceased by the time he was assigned there but he told me it was common to see unburied Japanese soldiers in various places. I thought of this when I saw the picture below. I’m betting that the skulls are Japanese since it’s unthinkable the Allies would have used unburied Australians or Americans. Just another reminder of the grimness of war.